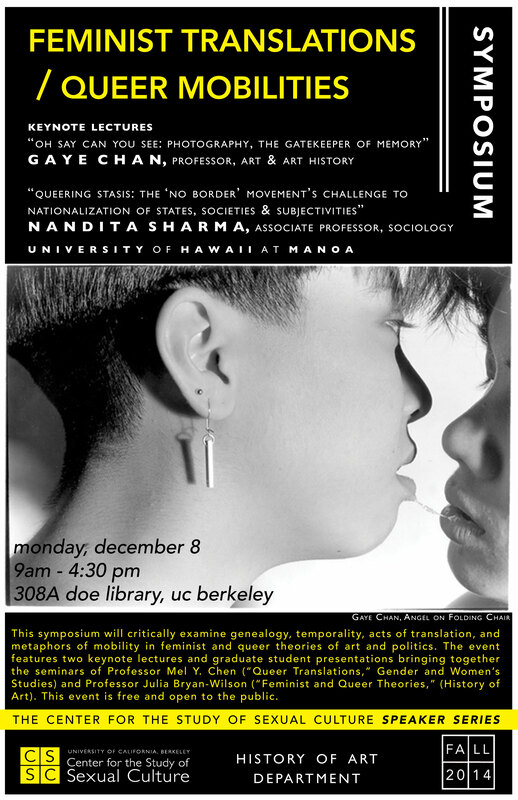 Paper Title: "Cruising Relationship: Considering Queer Affect and Collaboration"
The UC Berkeley Center for the Study of Sexual Culture and the History of Art Department present the daylong symposium Feminist Translations/Queer Mobilities on December 8. It will critically examine genealogy, temporality, acts of translation, and metaphors of mobility in feminist and queer theories of art and politics. It will attempt to give equal attention to artists and art objects as to theories, practices and methods, while presuming that the two domains are of course deeply intertwined. Bringing together the graduate seminars of Professor Mel Y. Chen (“Queer Translations,” Gender and Women’s Studies) and Professor Julia Bryan-Wilson (“Feminist and Queer Theories,” History of Art) to foster trans-disciplinary conversation and debate, this event will feature graduate students presenting their final projects as well as keynote speakers Gaye Chan, Professor of Art & Art History, and Nandita Sharma, Associate Professor of Sociology; University of Hawaii at Mānoa.